Discussion in 'Weapons, Technology & Equipment' started by phylo_roadking, Feb 14, 2014. Compared to 1,075 fps for the 95mm item - as opposed to, say, the 2,600 fps of the 77mm tank gun derived from the 17pdr! Is there any chance that the two early tank-mounted howitzer types....the 3.7in seemed to have been derived by Vickers from a WWI item in their Carden-designed cruisers, and the 3in howitzer seems to date from 1926-28, but there's not much history of it available online...were SMOOTHBORE??? Official designations were Mortar for the 3.7" and Howitzer for the 3", but haven't got any detail beyond that yet. It's also very noticable that their "barrels" are remarkably thin-walled, and in the very few close-up pics I can find...including one of the original Churchill MkI prototype (I know, it's not officially a "CS" tank, but did use the same 3in howitzer in the hull) I can't make out the ends of the lands in the barrel. ...and David Fletcher's article in this month's CMV article uses the same pic, but even crisper detail. And yet the 3.7in is the one specifically referred to as a "mortar howitzer"! Is that comment referring to the HE round or the smoke round??? Later versions (designated "E") incorporated an additional safety mechanism: an internal "shutter", also activated by rotation of the shell after firing, which closed the channel between the striker in the nose and the powder magazine in the base until it was clear of the gun which fired it. On firing, the shutter resisted acceleration ("setback") and the accelerating shell body pushed against it, preventing the shutter from moving. When acceleration ceased shortly after the shell left the gun barrel, the shutter ceased to "set back" and was free to spin outwards, activating the fuze. In other words - it was rotation IN the barrel that "safed" the round UNTIL it left the barrel. Interesting. I have seen nothing which suggests that the 3.7" CS Mortar is a smooth bore. It may be a m,istake to read too much into the designation. The designation "Mortar"might have been to avoid confusion with labeling and ordering ammunition, as there were two types of 3.7" Howitzer in service. Note that the CS Howitzer used in later tanks is designated as the "95mm", even though its is built from a section of 3.7" AA gun barrel. Something similar happens to differentiate the incompatable ammunition for the 76.2mm ordnance known variously as the 3", 17 pdr, 76mm and 77mm guns. I've seen two mentions so far - only one with some credence behind it, an "informed" discussion thread on Tanknet from 2006 involving Tony Williams - that the 3in weapon was a drop-in repacement for the 2pdr...I.E. it could sit in the same trunnions/brackets - although against that I have to set David Fletcher's comment that the New Zealanders when they got some Matilda II MkIV CS tanks, they took the guns out and "made" them fit into their Valentines as they wanted an all-Valentine force....and passed the Matilda rolling chassis on to the Australians. "Making" the 3in gun fit doesn't sound quite like a drop-in installation...! 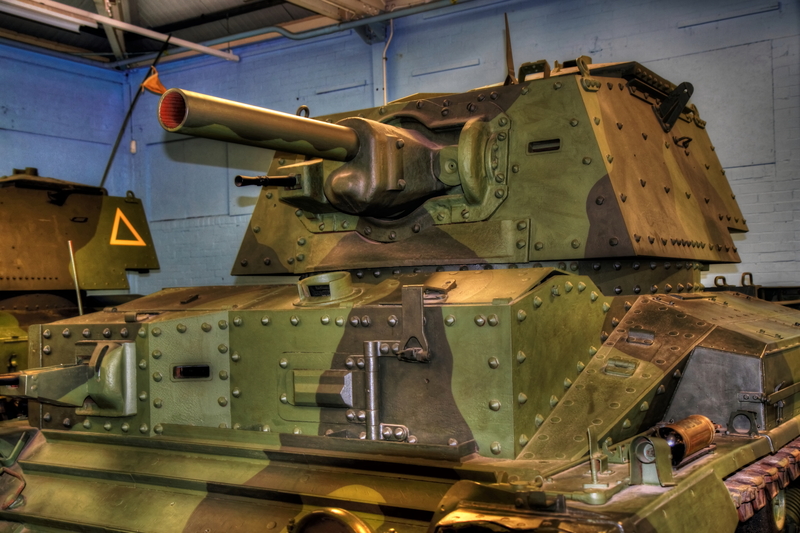 Against this - there's the strange instance of Gerry Chester's "MkIcs tanks" - which appear to be a standard MkI Churchill hull and 3in howitzer....and a Standard MkI/MkII turret on the top with a 3in howitzer in THAT...making a CS tank with TWO howitzers! So was the best way to reduce the recoil of the Howitzer to a manageable amount...I don't know as yet anything about the 3in's recoil system...and remembering that this weapon ALWAYS fitted in turrets initially designed for 2pdrs - was the easiest way to manage down recoil to reduce it with a low power charge, resulting in that very low muzzle velocity? And of course - a low power charge (resulting in low veolocity) wouldn't need anything more than a thin-wall barrel/tube, resulting in an all-up weight saving? Took a LOT of searching for a detailed enough pic! Was the longer barrel of the later 3in weapon an attempt to IMPROVE accuracy??? An ammo pic for you. From left to right: 17 pdr APDS; 77mm APCBC; 3 inch Howitzer; 3.7 inch Howitzer. By the way, barrel length doesn't usually have anything to do with accuracy, but it does affect velocity and range. Are you arguing that the zone - PER of a gun at a particular range is independent of the muzzle velocity or range? If this were true then there would be no need to have more than one range table per ordnance, rather than one firing table for each charge. Of coursezone isn't the same as accuracy as there are 14 other variable affecting the trajectory, which can be calculated or compensated for by the gunner. However, the zone of the gun will vary depending on the range,charge (MV) and trajectory, whether low or high angle. The variation between a gun and a howitzer has a direct bearing on the thread topic as it limits the expectations of a direct hit however truly the gun is layed..
For example, see the attached set of 2PER TOF tables for a post war FH70 Gun Howitzer - showing the Zone - the range plus and minus of the target between which 50% of rounds are expected to fall.. If engaging a target at range 1000m in the low angle using charge 8 the 50% zone would be 2m - pretty much comparable to a WW2 17 Pdr Atk gun. With this combination of ,trajectory and charge the FH70 can be laid like a tank gun and engage point targets. However, using the same ordnance, but lobbing the round as a howitzer with charge 1, the 50% zone is 24m. Even with the best laying skills the FH 70 @ charge 1 can only be expected to hit a point target by chance. (However the lethal splinter distance of the 155mm FH70 L15 shell is C 80m so within 25m is good enough to shred soft targets. The same would be true of the 3" and 3.7" howitzers. To use these weapons effectively the gunner needed to be trained to think like an artilleryman and consider HE as a way to suppress an area with splinters and not hit a point ..
and if the gun is elevated into the high angle as a mortar the 50% zone is 80m - not much different to the zone of a 81mm mortar at the same range using the optimum charge for the range. I don't think we are talking about the same thing. By accuracy I mean shot dispersion. At the relatively short ranges at which tank guns were fired (almost always in direct fire mode, with range limited to what the gunner could see, and ultimately by the maximum gun elevation permitted by the turret) the small increase in velocity of a longer barrel is unlikely to bring much benefit in terms of dispersion - and may actually worsen it (longer barrels tend to be less stiff and may whip more on firing). No argument that a higher velocity flattens the trajectory and reduces the flight time, increasing the hit probability against fleeting and especially moving targets, but that's a different matter. Hi Tony....just to check - is that 3.7in howitzer round definitely the tank howitzer round as opposed to the 3.7in mountain howitzer? Hi Sheldrake...have you seen the thread I opened last night regarding the No.30 sighting telescope as fitted to the Churchill MkI`s howitzer??? How is a tank gunner supposed to lay a 3in howitzer like an artilleryman with a simple crosshair sight? Your response tells me everything. I regard your site as on a par with Nigel Evans' on the RA. You are the master of direct fire weapons and ammunition. <s> We have corresponded before on matters of aerial gunnery on AGW where my handle was Randon. Yes. I have seen your post on this forum. The answer is - with difficulty. Life is easier with a better tank telescope or a dial sight, but nothing is impossible to a resourceful gunner. (*) It is quite possible to fire guns with nothing but a prismatic compass and firing table extracts with times of flight - as long as you know the location of the guns. Once you see a round on the ground correct for line; achieve a long bracket (400-800-1600m ) and half the bracket until 50m + or - the target. It takes longer without sights, but can be done. Translating this to the gunner station in a CS tank that answer is 1) ensure the tank is stationary. 2) fire a round and obser the fall of shoit. 3) correct for line and see a eound land in front or behind the target. 4 make a bold correction to bracket the target. It helps, bvut isn't essential to have fired the weapon before and know roughly how much different in range a full turn of the elevation hand wheel makes at something like the range to the target, But if not make bolder and bolder corrections until youn have seen a round plus and minus of the target. Half the bracket by applying half the next corrections (turns of the elevation handwheel or elevation measuered by gunners quadrant. There is a similar version where the man is still beraten and the god says let me teach you to pray "Hello Tango 22 this is India 31 fire mission over"
* The limits are when trying to apply gunnery principles to a computer simulation based n a digital interface. I once wasted an afternoon trying to develop an indirect fire rpocedure for the Warbirds tanks and the Char 1 Bis in WW2 online. The problem is that any command that can only be programmed using a key stroke will only make a change by a step increment, There is not way to make a micro adjustment by , say, turining the elevation wheel by a 1/8th of a turn. Maybe it would hzave worked if I foudn a wayu to map the eleation or traverse controls to an analogue controller. Translating this to the gunner station in a CS tank that answer is 1) ensure the tank is stationary. 2) fire a round and observe the fall of shoit. 3) correct for line and see a round land in front or behind the target. 4 make a bold correction to bracket the target. It helps, but isn't essential to have fired the weapon before and know roughly how much difference in range a full turn of the elevation hand wheel makes at something like the range to the target, But if not make bolder and bolder corrections until youn have seen a round plus and minus of the target. Half the bracket by applying half the next corrections (turns of the elevation handwheel or elevation measuered by gunners quadrant. But what if your CS tank only carries 4-8 H.E. rounds? That`s not a facetious question...I mean I take it there`s really no other way to do it than bracket and tighten in? With WW2 technology and training? I don't know, they're outside my research and collecting range so I don't know much about them. But the picture comes from a booklet on WW2 tanks. On checking my Big Book of Ammo Measurements, I see that both the "3.7 inch Howitzer" and the "3.7 inch Howitzer CS for cruiser tanks" are listed as using the same cartridge case (94 x 92R, with a 111mm rim) so are you sure that the ammo isn't the same? I had always assumed that given the very limited quantity of H.E rounds carried on the C/S tanks that they would only have engaged targets with direct fire. That`s one of the things I`m trying to determine...whether it is or not Information on the development of the two earlier howitzer installations is virtually non-existent, so every scrap of information, no matter how cirumstantial, helps. Hi David, ditto for me...but I`m trying to determine if it`s "only did" or were "only fit to"